Deluxe Helmet Bag: Great bag! CX500 Custom, CX500 Custom: I will always regret trading it away. and make hand carved personal items when I have the time. I worked in the music business in the south for 20 years in a previous life as an Organ an Electronic Music Instrument Technician. Not too many amps, organs, or keyboards I haven't had my hands on. Played Bass in a few local bands when I lived down south. Like a lot of folks, I became a dynosaur as no one repairs at the component level anymore. I have been married to the same wonderful woman (who treats me like a king ) for almost 25 years. Cherie has 2 children from a previous marriage who are grown and out on their own. Much to the dismay of my lovely wife, no grandchildren as of yet. Bought my first bike in late 1979. 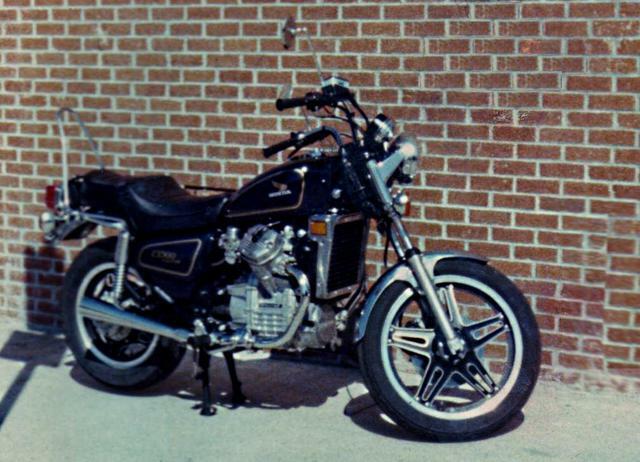 A Honda CX500 Custom and rode over 98,000 miles in a 4 year period. Sold it in 1984 due to circumstances and regretted the decision for the next 25 years. Favorite bands and musicians: Jerry Douglas, Acoustic Alchemy, The Doors, Clint Black, Aerosmith, Steppenwolf, Yes, The Eagles and too many more to name. Favorite places: Wide open spaces,twisty roads, and Mountains. Favorite stuff: My wonderful wife! Real friendships. Time off from work. A sunny day with an open road! Great food & Jack Daniels (after the ride)! Scary stuff: Watching my rights (to live, do, go, say, or buy what I want) being legislated or taxed out of existence!